Sonia Nazario won a Pulitzer Prize for the adult version of this at times heartrending, at times shocking story of a young Honduran boy who, in his teens, left Tegucigalpa to attempt the trek to the United States in search of his mother. Leaving Honduras on the life-threatening journey north when her son Enrique was five, Lourdes faced starvation and destitution, but eventually found work as a nanny and was able to send money home to support Enrique and his older sister, Belky. The money helped, but it was insufficient to still the aching sense of loss Enrique felt over his mother’s absence. At 16, desperate to get off the glue he sniffed and out of the grinding poverty of Honduras, desperate as well to find his mother and feel her love again, Enrique made the first of many attempts to train hop north to the United States. That he finally succeeded and reunited with his mother, then living in North Carolina, is little short of a miracle—but what he endured along the way is not for the faint of heart. And his fate upon arrival in the United States is not the stuff of fairy tales. Yes, there is gallantry and kindness, resilience and hope in this story—but it also serves to show what a long way we have to go in dealing constructively with the issue of illegal immigration. The book may be best suited for high school students who can deal with the complex prose and unremitting sadness of the story. 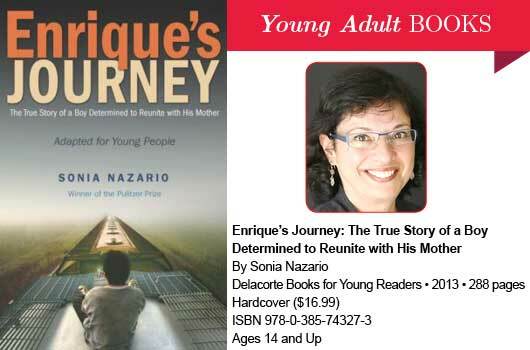 Family discussion will surely be welcomed as children follow Enrique’s difficult journey—both exterior and interior. —Reviewed by Ann Welton, Helen B. Stafford Elementary, Tacoma, WA.